Dishy News - A Transferware Blog: POLISHING A COW? "Cow Polisher" Pattern. 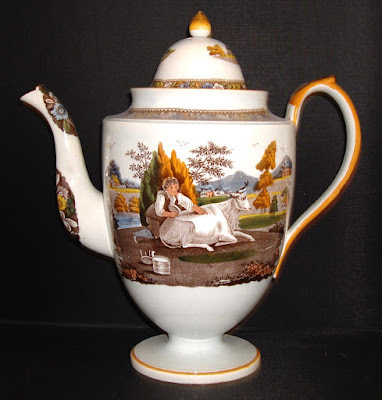 It is printed in brown on a 10 inch coffee, and it is colored under the glaze. Sometimes this type of printing and coloring is known as Salopian. I have owned this coffee pot for a long time. 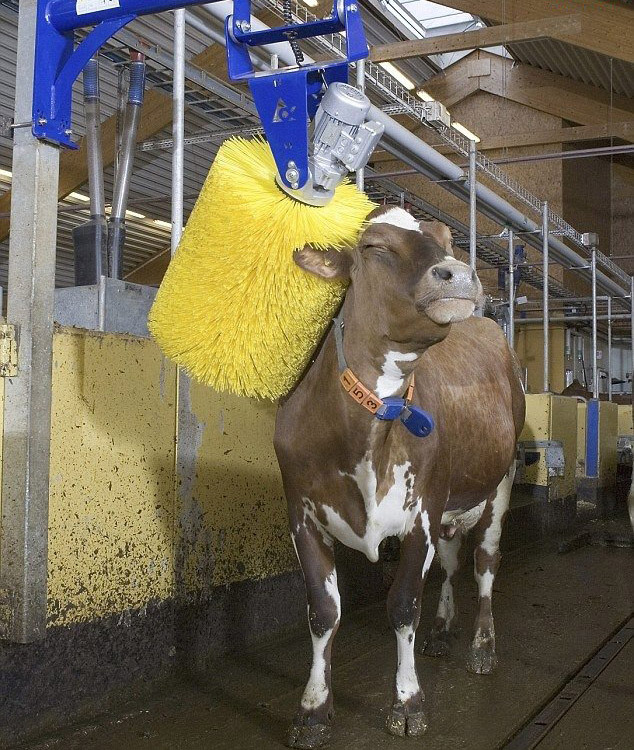 The name assigned to the pattern by Friends of Blue is "Polishing A Cow." 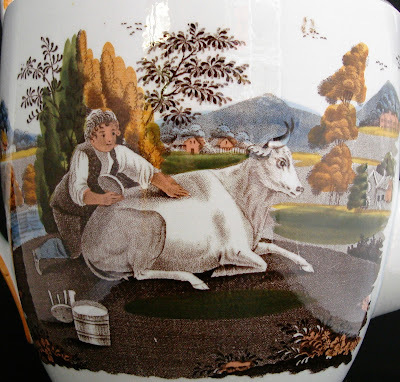 In the database of the Transferware Collector Club, it is called "Cow Polisher." I thought a more common American name would be cow groomer. However, the more I looked at the pattern and thought about it, I wondered about the item in the boy's hand. Perhaps it is a comb or brush, but I can't see any evidence of teeth or bristles. Also, notice how the boy is holding the item. If there were bristles or comb teeth, he might have his hand on them. The item looks more like a saucer or bowl. Maybe the boy has used the saucer to drink the milk that is in the bucket. The boy is leaning over the cow and petting her. Perhaps he is thanking her for the milk. The pattern is popular, and it was made by more than one manufacturer. A sugar bowl pictured in the Friends Of Blue Bulletin 105, p. 9 is impressed "Shorthose & C" for Shorthose & Co. (1817-1822). The TCC database also lists the pattern above as made by Shorthose. 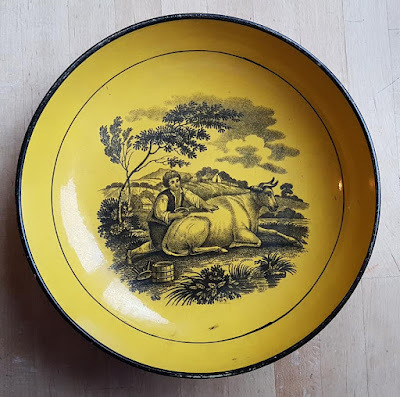 However, a cup and saucer on the Facebook page "British Pottery and Porcelain Discussion Group" on January 11, 2019 shows a slight variation of the pattern. The boy appears thinner and more finely drawn, there are no bushes behind him, and there is a large tree to his left. 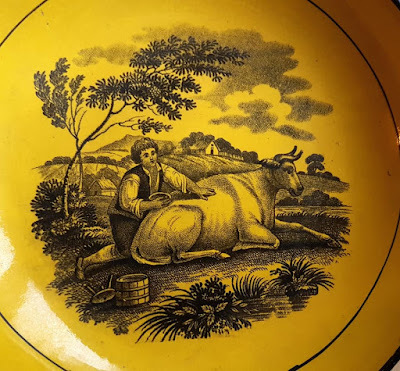 I always find it interesting to see what different manufacturers did with the same pattern, but I am more interested in what the boy is doing with the cow. Is he grooming her? Or is he drinking her milk? Let me know what you think. 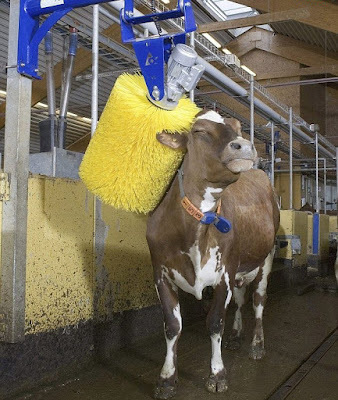 Do people actually groom cows? Of course. I found many videos of cow grooming on YouTube. And one more photo found for me by Susan. Thanks!